Are you sure you want to remove "Framing a Window Opening" from My Projects? Many windows must be custom-ordered several weeks in advance. 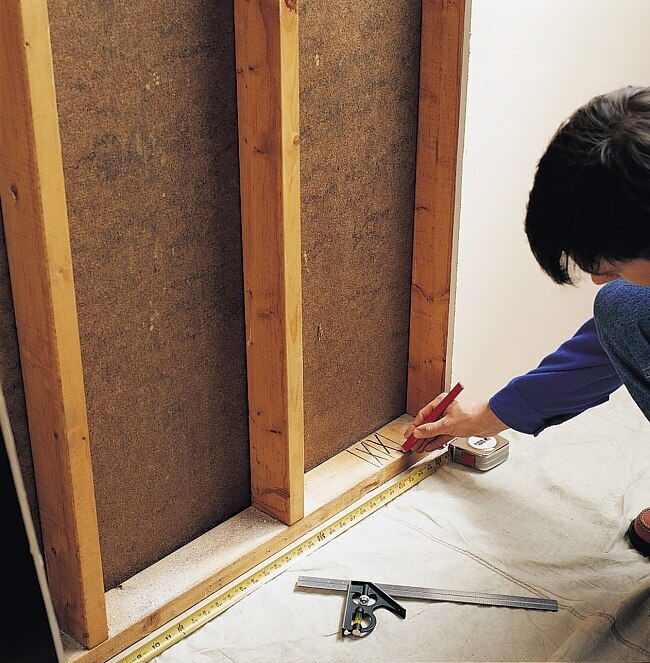 To save time, you can complete the interior framing before the window unit arrives, but be sure you have the exact dimensions of the window unit before building the frame. 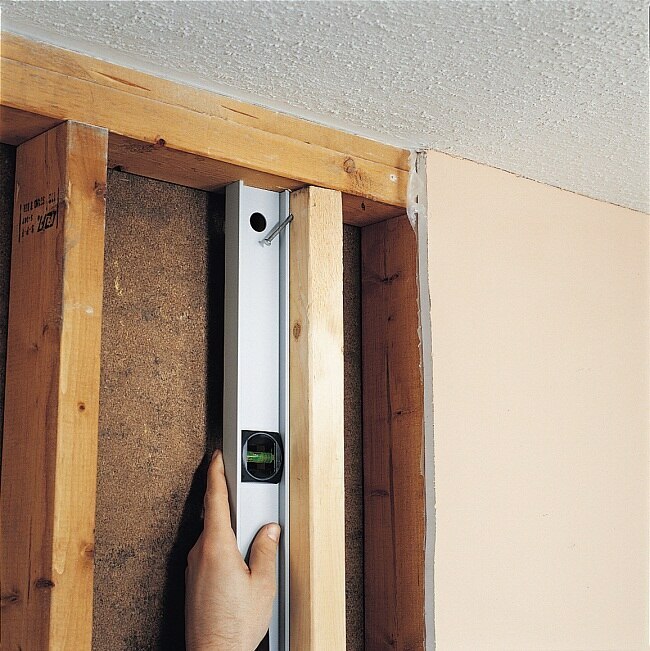 Do not remove the outside wall surface until you have the window and accessories and are ready to install them. 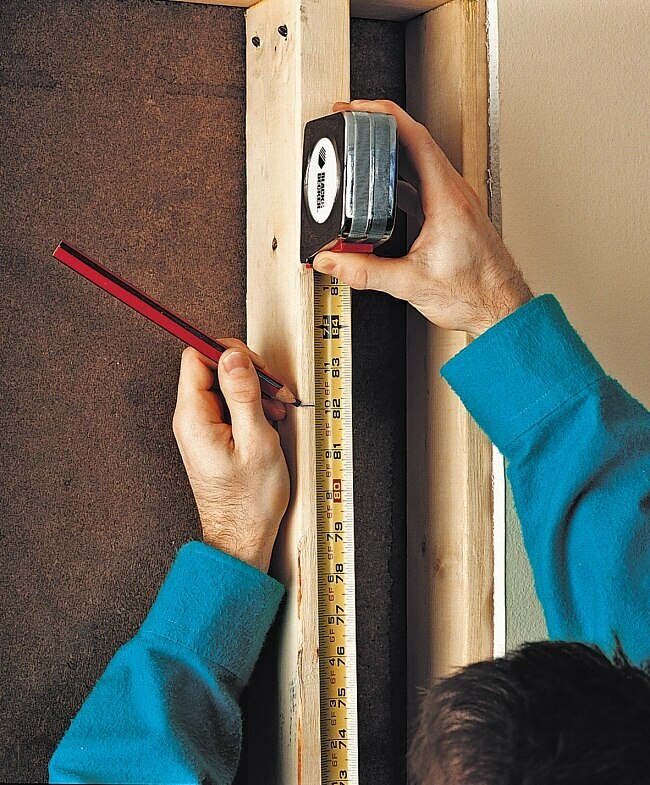 Follow the manufacturer’s specifications for rough opening size when framing for a window. The listed opening is usually 1" wider and 1⁄2" taller than the actual dimensions of the window unit. The following pages show techniques for wood-frame houses with platform framing. 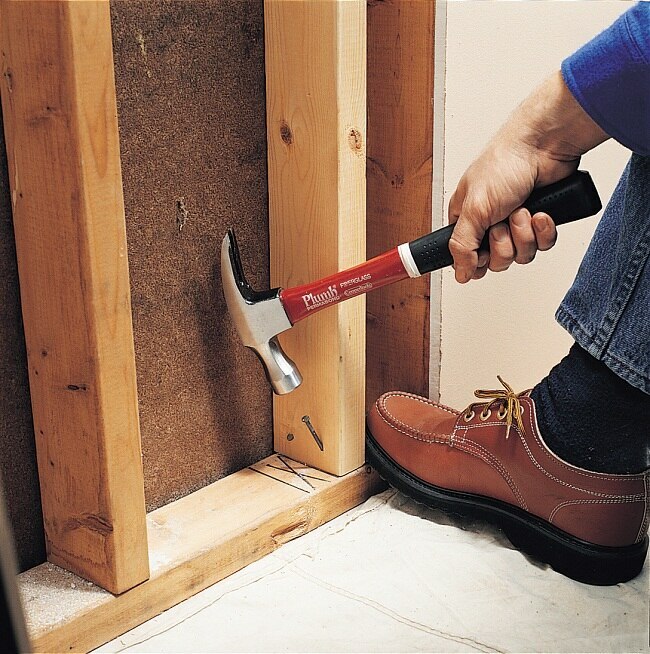 If your house has balloon framing where wall studs pass continuously from one floor to the next, use the method shown to install a header. Consult a professional to install a window on the second story of a balloon-framed house. If your house has masonry walls or if you are installing polymer-coated windows, you may want to attach your window using masonry clips instead of nails. Measure and mark the rough opening width on the sole plate. Mark the locations of the jack studs and king studs on the sole plate. Where practical, use the existing studs as king studs. Measure and cut the king studs, as needed, to fit between the sole plate and the top plate. Position the king studs and toenail them to the sole plate with 10d nails. Check the king studs with a level to make sure they are plumb, then toenail them to the top plate with 10d nails. Measuring from the floor, mark the top of the rough opening on one of the king studs. This line represents the bottom of the window header. 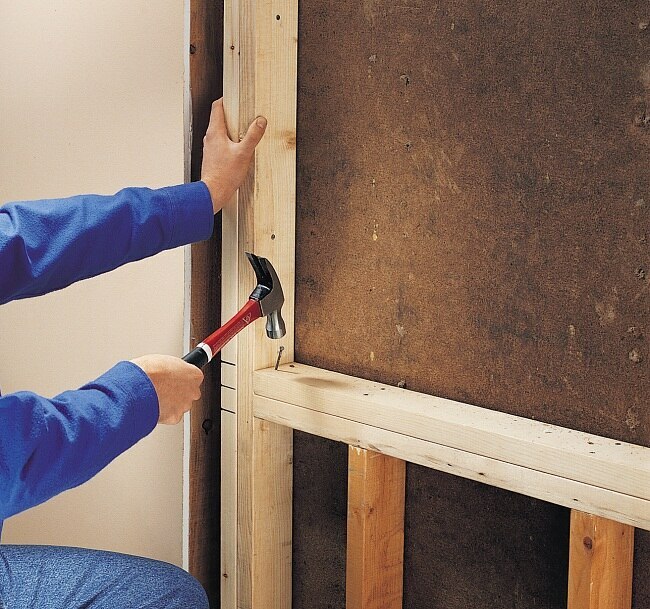 For most windows, the recommended rough opening is 1⁄2" taller than the height of the window frame. Measure and mark where the top of the window header will fit against the king studs. The header size depends on the distance between the king studs. 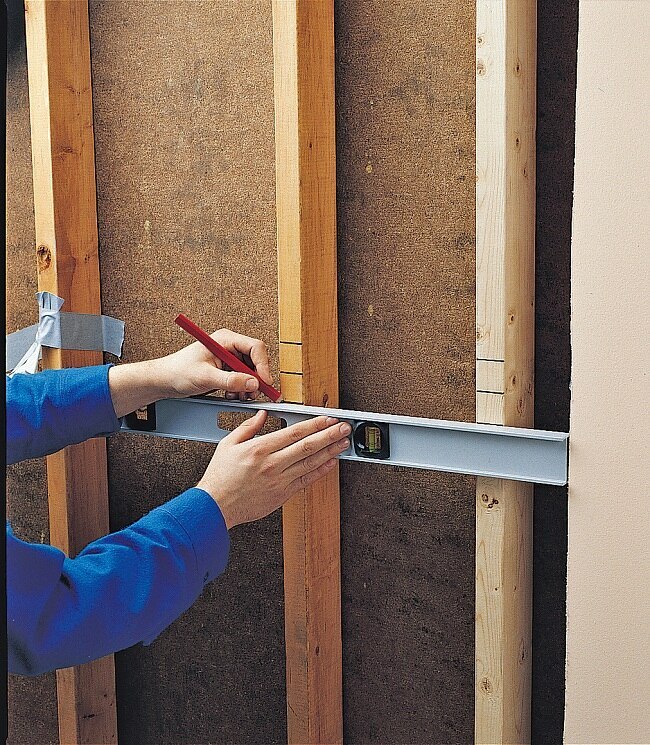 Use a carpenter’s level to extend the lines across the old studs to the opposite king stud. Measure down from the header line and mark the double rough sill on the king stud. 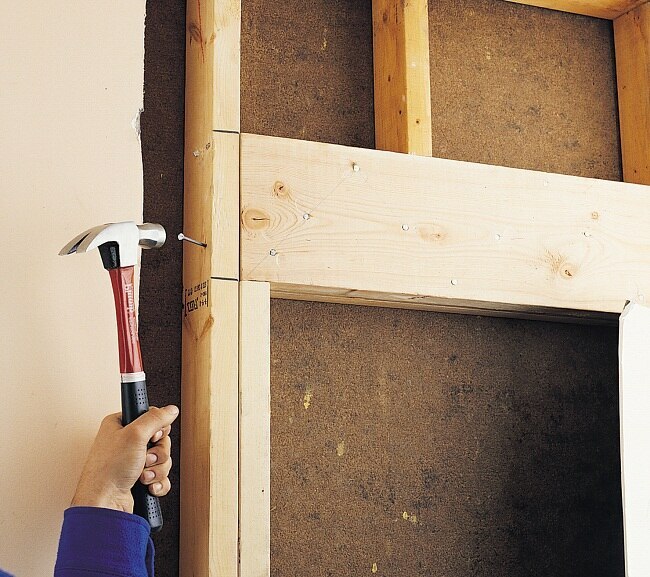 Use a carpenter’s level to extend the lines across the old studs to the opposite king stud. Make temporary supports if removing more than one stud. 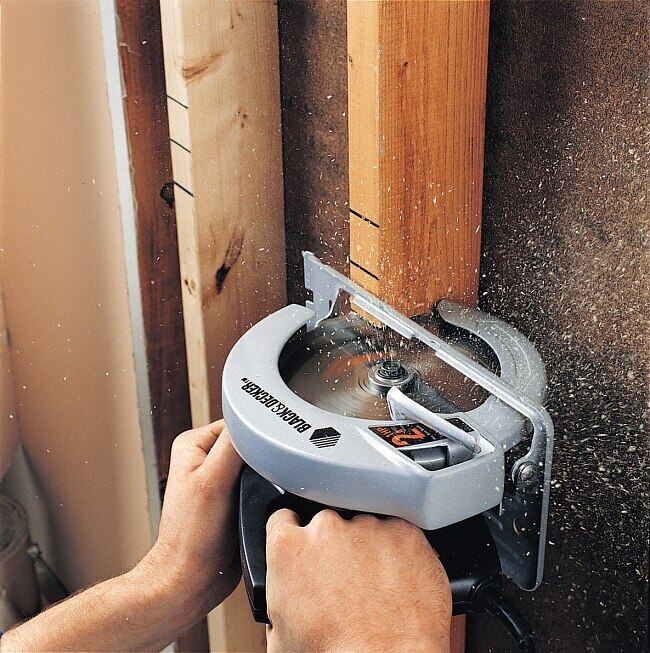 Set a circular saw to its maximum blade depth, then cut through the old studs along the lines marking the bottom of the rough sill and along the lines marking the top of the header. Do not cut the king studs. 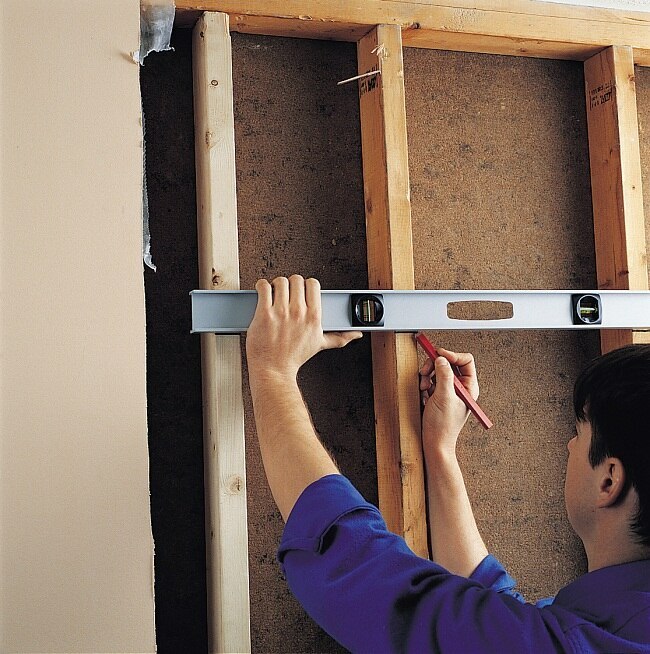 On each stud, make an additional cut about 3" above the sill cut. Finish the cuts with a handsaw. 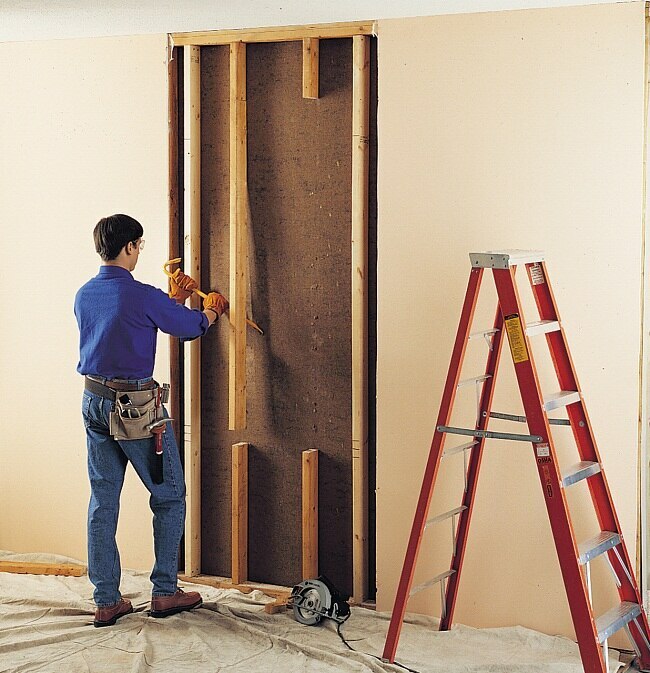 Knock out the 3" stud sections, then tear out the old studs inside the rough opening, using a pry bar. Clip away any exposed nails, using nippers. The remaining sections of the cut studs will serve as cripple studs for the window. 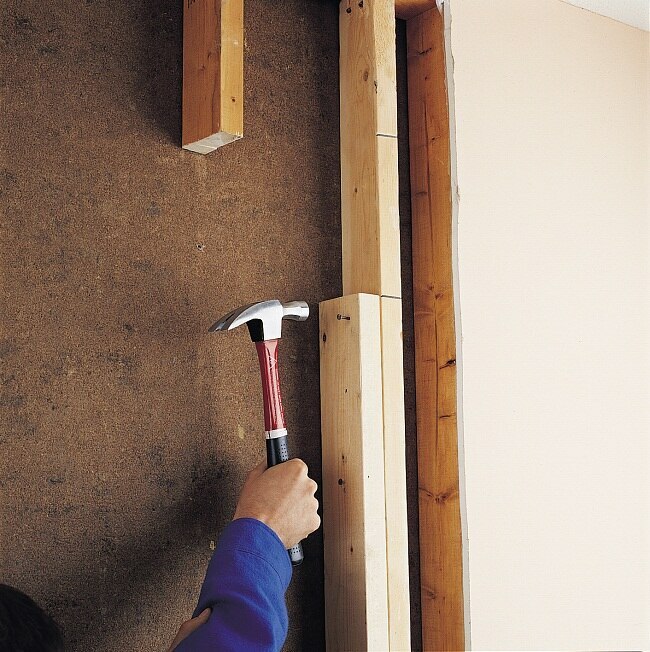 Build a header to fit between the king studs on top of the jack studs, using two pieces of 2×4 lumber sandwiched around 1⁄2" plywood. Cut two jack studs to reach from the top of the sole plate to the bottom header lines on the king studs. Nail the jack studs to the king studs with 10d nails driven every 12". NOTE: On a balloon-framed house the jack studs will reach to the sill plate. Position the header on the jack studs, using a hammer if necessary. Attach the header to the king studs, jack studs, and cripple studs, using 10d nails. 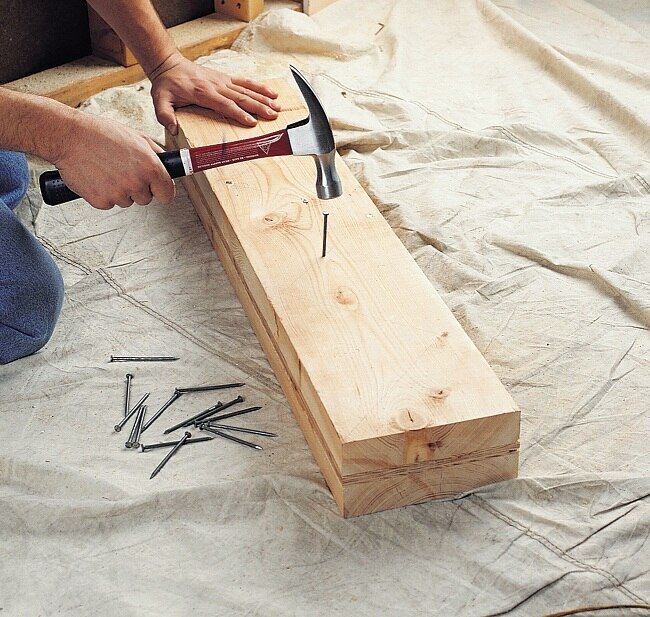 Build the rough sill to reach between the jack studs by nailing a pair of 2 × 4s together. Position the rough sill on the cripple studs, and nail it to the jack studs and cripple studs with 10d nails.